The first of five Blizzard blogs on the development of Diablo patch 1.0.4 has landed. It pokes an investigative finger into some of the system changes to be introduced in the upcoming patch, which Bashiok has revealed will arrive in the fourth week of August. If you like staring into the numbered abyss of Magic Find and mob HP tweaks, you can read the full patch preview, otherwise I’ve summarised the thing below. Bullet points, for your withered attention span. Magic Find will no longer be averaged in co-op play. What does this mean? Previously, any MF boosts you had would be shared out in co-op, to stop one greedy player from donning a weak set of MF-boosting armour to the detriment of the rest of the team. Normal monsters will drop four times more rares. What does this mean? Well, in Inferno, normal mobs are set to receive 5-10% health boosts alongside a greater chance to drop magic and rare items – a four times greater chance, in fact. Some Elite packs are being weakened. What does this mean? The HP of Elite packs are coming down 10-25%. Some of the more frustrating affixes of Elite monsters are being dialled down, such as Fire Chains and Shielding. Invulnerable minions are also being removed. Two handed weapons are being improved. What does this mean? The blog goes into some details on how they’re planning on making two-handers useful again. Currently they’re a bit pointless, as it’s nearly always more beneficial to carry two one-handers with better stats on each hand. Item Level 61 and 62 weapons are being improved. What does this mean? Previously, you could tell at a glance that a level 61 item stood no chance of being worth as much as a level 63 item. Now, level 61 and 62 items will be able to roll base damage that goes as high as the top end of a level 63 item. Enrage Timers are gone. What does this mean? The maligned Enrage Timers made Elite packs impossible to beat after a set period of time, to prevent lower level players simply chipping away at their health. They’ve been removed for everything but boss fights. Repair costs are coming down 25%. What does this mean? Repairing your stuff is cheaper now. 25% cheaper! Pow! 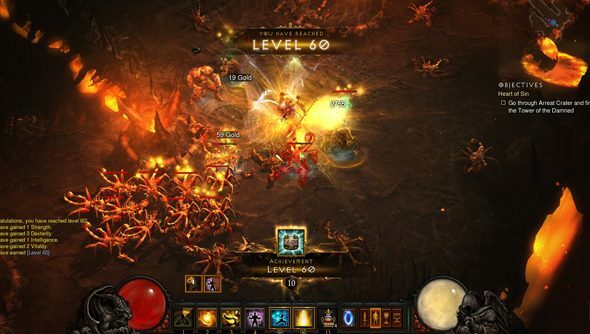 More Diablo 3 developer blogs are expected this week, which will describe in excruciating detail the changes being made to Magic Find, class changes, and legendary item improvements. For the calendar fearing,Bashiok’s tweet places patch 1.0.4’s release date as somewhere between August 20 (one week from now)and August 24.